Fitness Superstore, located in the San Francisco Bay Area, is open to the public daily! We sell remanufactured fitness equipment, including ellipticals, exercise bikes, home gyms, stair climbers, and treadmills. Our selection includes both home and commercial versions of top selling brands like Bowflex, Precor, and Life Fitness. Our certified technicians remanufacture equipment and meticulously inspect every part of a machine to make sure it exceeds the expectations of all our customers. Our experienced sales staff will be happy to answer any questions you may have and help you find gym equipment for your specific needs. Stop by during our business hours to check out our equipment or to speak with our knowledgeable staff! 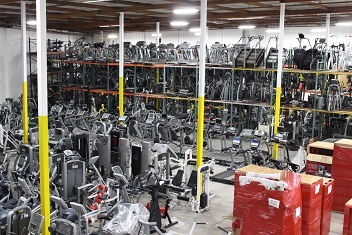 Remanufactured Ellipticals: We typically have Cybex, Life Fitness, Octane, Precor, and Star Trac ellipticals in stock. Remanufactured Exercise Bikes: Cybex, Expresso, Life Fitness, Monark, Nustep, Precor, Scifit, and Star Trac are often in stock. Remanufactured Stair Climbers/Steppers: We carry Life Fitness, Precor, Stairmaster, and Versaclimber machines. Remanufactured Strength Training Equipment: We always have a large variety of strength training equipment in stock from Cybex, Life Fitness, and much more! Remanufactured Bowflex Treadclimbers: We almost always have the TC3000, TC5000, TC5300, and TC6000 in stock. We often stock other models as well. Remanufactured Treadmills: We have a wide selection of home and commercial treadmills! The brands that we usually stock include Cybex, Life Fitness, Matrix, Precor, Star Trac, and Woodway. Vibration Platforms: We typically stock both new and remanufactured Power Plate vibration platforms. Our Inventory changes daily, so when the equipment you are looking for is out of stock, we may get it in soon! Click here to shop for fitness equipment or contact us for real time inventory, as we have much more than what is listed above. Within Northern California, our knowledgeable staff will personally deliver your fully assembled machine and place it in the room of your choice. Your equipment will arrive 1-4 Weeks after placing your order if you are located in Northern/Central California. If you have any additional requests please indicate so on the 'order comments' at checkout.